By the time the pioneers got to their destinations, they were exhausted and simply glad to stay in one place for a while. It was at that point when they realized things were not going to get any easier from here on out. If one was fortunate enough to have brought things like tablecloths, they most likely would have ended up being used as material for clothing or even shelter. Simplistic living such as the pioneers did is hard for those of us living in the age of information technology to comprehend. Review some of the facts below about pioneer tools and how they were used. Remind students that a tool is anything that helps to do work. In the pioneer world, there were no refrigerators. Pioneers often smoked or salted their meat to keep it put up. Fruits were dried and cooked later. Winter was a harsh time for them, but also a blessing as pioneers could pack meat into "snow barrels" to keep over the winter. Of course, pioneers did not have electricity. There were no light bulbs. Pioneers used candles that they made themselves to light the way. However, there was not always a need for this since they were usually woke up by the sun and tired enough at the end of the day to be in bed when the sun went down! There were no power tools, so all the work was done with hand tools. Trees were cut and made into boards using hand saws, wedges and axes. Homes were built using hammers and highly effective notches. Women found themselves tending the field as well as the house since survival was everyone's concern. Often, the pioneers would each have their own bowl and fork and no other kitchen utensils. This certainly cut down on the dishes! There were no cars, trains or trolleys at this point in time, so all travel was done by horseback, donkeys, wagons or walking! 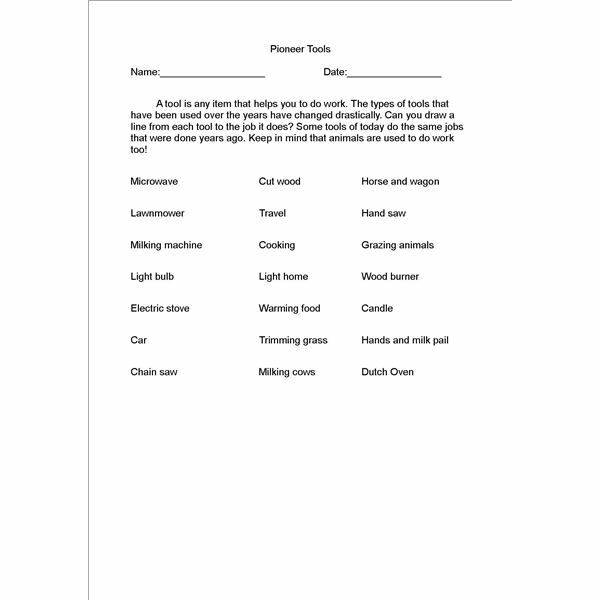 Use the history worksheet included to help students to understand the differences between the tools of today and the tools used by the by the pioneers.